5 Reasons You Don't Want to "Be Like Bill"
You are perfect, just as you are, so there’s really no reason to want to “Be Like Bill”, or anyone else for that matter. That desire to want to please others or to belong is not part of what makes you, you. You are special, unique and different. You are unlike anyone you have ever met. You have your own style, your own preferences, your own beliefs, attitudes, emotions, thoughts, wisdom, skills and so much more. And no one else has exactly the same exact experiences in what makes you, you. So why would you want to Be Like Bill or anyone else? Be Like Bill is the most recent wave of meme generators, this one from Blobla which features a stick figure who acts superior to others. Blobla asks you to put in your name and gender and generates a meme telling people in what ways you are superior to others. These popular memes have plastered the pages of social media and the over-abundance of them is more than just annoying, it can be hurtful. Wanting to be part of the Be Like Bill meme comes from multiple different places in your psychology. There is the desire to be liked, the desire to be socially accepted, the desire to be part of the in-crowd, the desire to be on the cutting edge of new trends, the desire to display your superiority, or the desire to change others’ behavior based on your choices. All of this is a psychological mashup of reasons for you to be other-focused, not self-focused. Have you ever heard the expression “You can’t pour from an empty cup?” You are the cup and what is in it. When you focus on others rather than on yourself, you are pouring from your own cup into theirs. If you empty your own cup, you have nothing left for yourself. People have called the Be Like Bill meme passive-aggressive, insensitive, smug, annoying, click-bait, and clutter that adds no value. Stick figure Bill is not only better than you are, he thinks he is able to pass judgment on you because you are not like him. He passes judgment on you without even knowing you. The Be Like Bill meme will never praise you for your behavior, he is always negative in his assessment of you. The psychological theory behind this tendency to compare others to us is called The Theory of Downward Comparison. Researchers speculate that people who feel negative emotions can enhance their sense of well-being through comparison with a less-fortunate other. You can always find someone worse off than you are, right? So why not let ‘Be Like Bill’ help you find your less-than-you friends who can be identified by their complaints on your Facebook page? This sounds like very passive-aggressive behavior. Stick figure Bill in the meme thinks he is better than you in some way. He does many things better than you and he is not afraid to tell other people how much better he is than they are. When someone tells you that they are better than you are in some way, it can prompt a variety of emotions; jealousy, anger, bitterness, resentment, frustration, sadness or depression. None of these things is a positive emotion that builds up your self-worth. Your intrinsic value is greater than Bill’s because you embrace your differences rather than saying why your differences make you better than other people. The Be Like Bill meme brings up separatist issues for some people. He is assigning a value to others who he perceives as being less than himself. 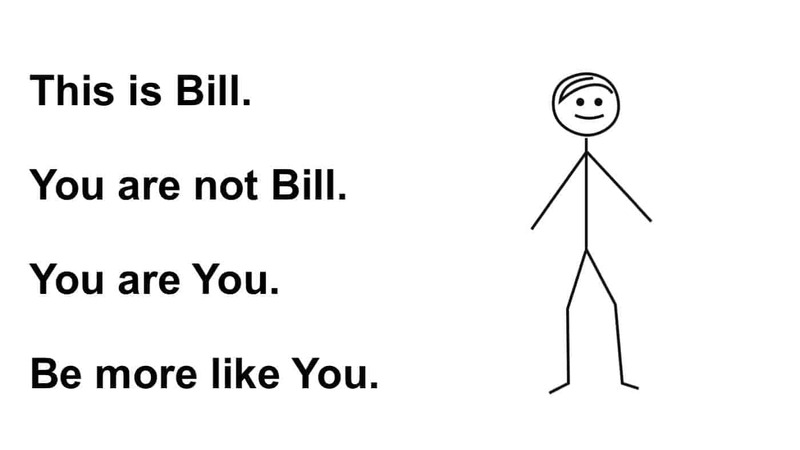 Therefore, if you are not like Bill, you are somehow less-than. No one wants to be treated as less-than someone else. To treat others with less value than oneself is to be in the company of Hitler, misogynists, homophobes and apartheid supporters. A culture of separatism is being perpetuated by Bill’s narrow worldview. “Be like me or else be excluded” is what Bill seems to imply. Bill the stick figure meme is only interested in people like him. You could choose to be like Bill but then you limit your possibilities. Your own freedom to express yourself is unlimited. Why let Bill influence your actions? Why is Bill trying to control or limit you? Do you know someone who needs to be less like “Bill”? Share this to help us spread the messaage of being your authentic self!